Lawrence Kroll is a 1988 graduate of the University of Pennsylvania, and a 1991 graduate of the Yeshiva University Benjamin N. Cardozo School of Law. He is admitted to the New Jersey Bar, the United States District Court for the District of New Jersey, and is an inactive member of the New York bar. He is a member of the New Jersey Bar Association and the Middlesex County Bar Association. Lawrence has over twenty-five years of legal experience. He has worked as a mortgage banker for a number of years offering a unique perspective regarding the resolution of his client’s legal issues. 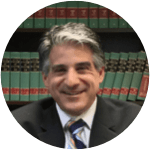 Larry now focuses on civil litigation, personal injury litigation, workers’ compensation litigation, matrimonial and family law, social security disability appeals, and municipal court representation. Having worked both within and outside the legal profession allows him to blend these experiences to focus on the representation of the firms' clients with both a legal and business background.